This is one of two new titles from the acclaimed master of recreating the ancient world. 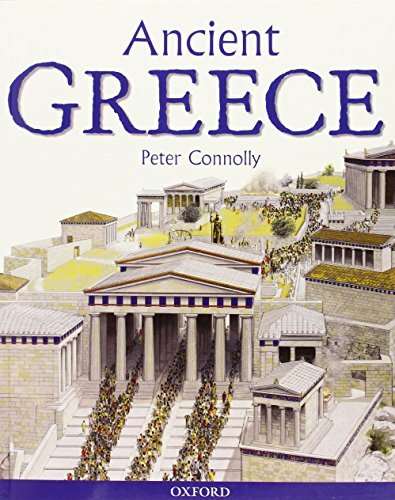 Peter Connolly's superb illustrations bring to life the world of ancient Greece, in the 5th century BC, when Athens was home to some of the greatest artists and thinkers in history. All aspects of life in the city are revealed, as we watch Athenians in their homes, at the theatre, at work, at worship and at play. Perfect to support homework for children aged 8+ . Peter Connolly is a best-selling author and illustrator of the ancient world. His previous books with Oxford include Pompeii, The Roman Fort, The Legionary, The Cavalryman, The Ancient Greece of Odysseus, The Holy Land and The Ancient City. These have sold over 250,000 copies in English, and have been translated into many other languages. Peter Connolly is an Honorary Research Fellow of the Institute of Archaeology, London. Peter Connolly is a best-selling author and illustrator of the ancient world. His previous books with Oxford include Pompeif, The Roman Port, The Legionary, The Cavalryman, The Ancient Greece of Odysseus. The Holy Land and The Ancient City. These have sold over 250,000 copies in English, and have been translated into many other languages. Peter Connolly is an Honorary Research Fellow of the Institute of Archaeology, London.